Are You Making Music Or Making Hits? There’s a huge difference in being involved in the process of making music and making hits (i.e. navigating the music industry). These are two distinctively different activities, which depending on your goals, should be approached with varying strategies. While one concerns itself primarily with musical aesthetic, the other plays a game in which success is measured by sales figures and other monetary indicators. On the surface this may sound like the age old argument of "keeping it real" vs. blowing up, but is it really wise to focus on making hits and generating revenue? I’d be willing to argue that this very focus on becoming a star, succumbing to the latest sheep-like trends, and producing marketable, yet disposable music has significantly contributed to the fundamental problem of widespread consumer dissatisfaction and the resulting decline in music sales that currently plague the industry. In the very near future, as alternative music distribution avenues truly come of age, labels will cease to be necessary in their traditional sense. Consumers will no longer need to tolerate mass media outlets, blanket programming, and generic marketing campaigns to obtain their music fix. Just think about how services such as Pandora, imeem, and Last.fm have already altered your own music selection and listening habits. Now multiply that by millions of users and factor in even more possibilities a couple of years down the line. With trends headed towards catering to the tastes of individual listeners, it may not be a smart decision to focus you efforts on the masses. Are you shooting at a target that has already past? I’ve never been hunting, but I can assure you of the need to aim for where the target is going to be in the future rather than its current position. Think about where you’d like to be in the next two, five, or ten years. Now imagine where media is moving and how the two of you may possibly intersect. Here’s the kicker… if you’re not willing to invest at least five years in making your music a true success, then perhaps it’s time to reevaluate your goals and do something else that you either sincerely enjoy or is at least guaranteed to monetarily reward your efforts. 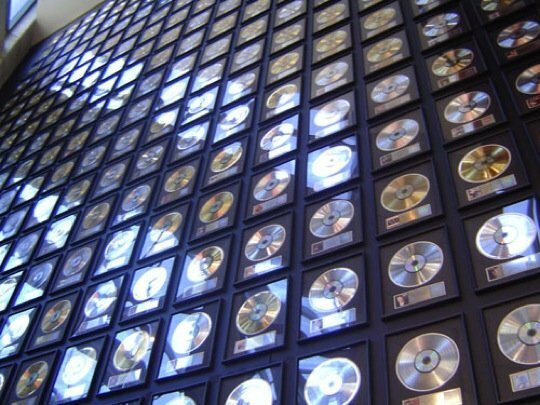 Let’s think about it this way… the very nature of stardom, its competitive nature, and the sheer numbers involved, only a handful of people can achieve financial success as traditionally defined by the recording industry. I know it sounds overly pessimistic, but the odds of you landing a deal, becoming a star, or appearing in an episode of Cribs are slim to none. Take into consideration the changing environment of the music business along with future advances in technology, media distribution, and shifting business models; now you’ve pretty much written yourself a completely personalized recipe for failure. Contrary to the opinion of the RIAA, clueless music executives, and pesky PR folks, there are no shortcuts to making great music and the general public is very much capable of discerning a sincere creative effort from a contrived marketing package. Music derives from individual expression and is much more than a series of shortsighted, opportunistic marketing tricks, controversial YouTube videos, and slick MySpace pages. Of course, what I’m really talking about is a fundamental issue of ethics, authenticity, and intent disguised as a technology and marketing rant. Some questions to ask yourself: Why bother making music at all? What’s your purpose? Is stardom for the sake of stardom a goal that you find enriching? Some may call it shallow, but if that’s your thing, there are plenty of other, much easier avenues to achieve your goal. If your intent is to become rich beyond your wildest dreams; again, there are many other, more productive activities you could engage in. If your primary concern is to make great music, then by all means join the legions of passionate and creative individuals working to express his or herself by making authentic musical connections with like-minded listeners and musicians. The good news is that all the coming changes in media are completely conducive to artists, producers, and musicians looking to leverage technology and find a loyal audience truly appreciative of their efforts. By focusing on making music, you’ve already defined your own success. Perhaps its wishful thinking…This is a country that elected the “W” President of The USA for 2 terms. I thought long and hard about making that statement and ultimately came to the conclusion that people are too busy to search for better music. The average person does not have time to do the heavy lifting and sift through the multitudes of garbage to find that unknown gem. I’m convinced that when presented side by side, the average person would be able to tell the difference crap music and quality. Luckily, some of the services listed in the post are allowing consumers to be exposed to new artists. On the “W” issue… it’s amazing what propaganda and swift boating can do. It’s frightening to think that it could happen again. If the McCain/Palin ticket succeeds, I’ll have to write off most Americans as being a flock of sheep deserving to every foul thing that comes to them. attention? I mean Are You Making Music Or Making Hits? is a little plain. You ought to glance at Yahoo’s front page and watch how they create post titles to get viewers to click. I simply had to thank you very much once more. I do not know the things that I would’ve accomplished without those strategies shared by you regarding such a concern. This was a very depressing setting in my position, nevertheless witnessing the specialised form you solved it made me to cry for delight. Now i am happy for the advice and even believe you really know what a powerful job you’re undertaking training other individuals using your webpage. I know that you have never met all of us. Previous post: 8-Bit Digital Sampler Hack – Where’s The Party At?